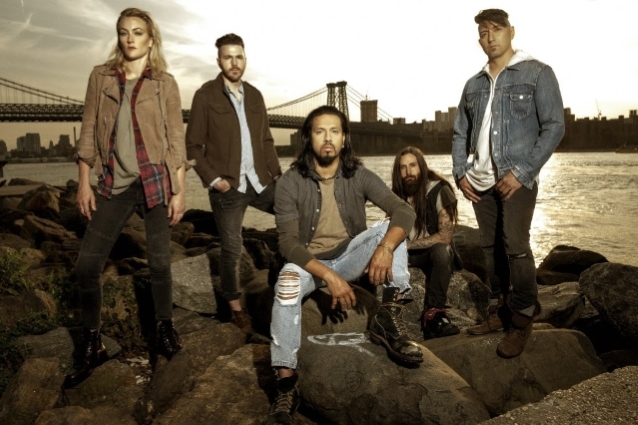 POP EVIL frontman Leigh Kakaty says that the band will "start thinking about" a new album before the end of the year. The Michigan rockers' next release will be the follow-up to last years's self-titled effort, which saw the group working with a new producer, Kato Khandwala, and incorporating a heavier and harder edge, thanks to songs like "Art Of War" and "Colors Bleed". Speaking to the Rock 100.5 The KATT radio station before POP EVIL's January 19 concert in Oklahoma City, Leigh said about the band's plans for the rest of the year (hear audio below): "We go right from [the current U.S. tour] to Europe. So, try to just keep growing the market over there. And then we come home, [have] maybe a couple of weeks off, and we go right to Australia. It's our first time in Australia. Anytime we can add other countries to the mix, it's something that we definitely try to take very seriously. It's not easy to do. And then we'll come back around May, June and just start that summer festival rush. Just keep touring non-stop. And then, probably right around towards the end of the year, we'll start thinking about new music and a new record. But right now we're just focused on the task at hand and just touring non-stop." Kakaty also talked about the experience of sharing the stage last summer with POISON and CHEAP TRICK as part of the "Nothin' But A Good Time 2018" tour. "It was incredible, man — easily probably one of the most memorable tours of our career," the singer said. "The vibe, the way the chemistry was between all three bands. Both POISON and CHEAP TRICK kind of treated us like big brothers, big sisters with [POP EVIL drummer] Hayley [Cramer]. It was a special summer." According to Leigh, POISON and CHEAP TRICK fans were "really welcoming" of his group. "Obviously, that's why they wanted us on the tour — a new up-and-coming radio band," he noted. "They wanted to have fresh… 'Cause those older fans are bringing their kids and that next generation. So it was awesome, the way they embraced us. Maybe on paper, at the start of the tour, it looked a little weird for people, but for us, and the way it ended up, it was just the perfect tour. It was just an incredible experience. And hopefully we'll get to play with those guys again. It would be great."